Floating eggs: a bad egg, or just buoyant? Is it safe to reuse egg cartons? With their secure lid and uniform compartments, it seems a shame to toss out a used egg carton. 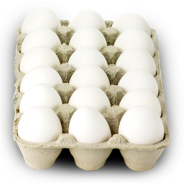 While they are perfect for storing and protecting eggs, so many ways to reuse them also come to mind. Just browse around Pinterest, where there are dozens of boards dedicated to egg carton crafts!